No, not the Father General of the Jesuits, sometimes referred to as "the Black Pope,"
but rather a Black Pope. Wilton Daniel Gregory, 60, the Archbishop of Atlanta, (pic above) said that in the past Pope Benedict XVI had himself suggested that the election of a black pontiff would "send a splendid signal to the world" about the universal Church. Archbishop Gregory, who in 2001 became the first African American to head the US Bishops Conference, serving for three years, said that the election of Mr Obama was "a great step forward for humanity and a sign that in the United States the problem of racial discrimination has been overcome". 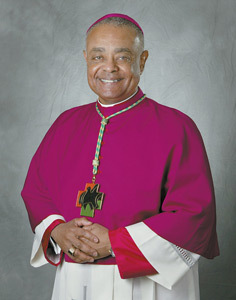 Like Mr Obama Archbishop Gregory comes from Chicago, and was previously Bishop of Belleville, Illinois. 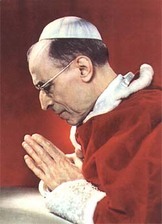 He said that recent Popes, beginning with John XXIII and Paul VI, had brought prelates "from all nations and races" to Rome to take up senior positions in the Curia, the Vatican hierarchy. This offered "an international vision of a Church rich in diversity", he told the Italian newspaper La Stampa. Pope Benedict — whose next encyclical is on globalisation and social justice — had a "world outlook" as a theologian whose thought had "opened hearts and minds on five continents", Archbishop Gregory said. The former Joseph Ratzinger, who as a young man in his native Germany had witnessed "the horrors of the Second World War", spoke a "universal language". Archbishop Gregory said that the next time cardinals gathered to elect a Pope they could "in their wisdom" choose an African pontiff. "My own election as head of the US Bishops Conference was an important signal. In 2001 the American bishops elected someone they respected regardless of his race, and the same thing could happen with the election of a Pope." He said that in a papal conclave, the cardinal-electors were "guided by the Holy Spirit to choose the person who best responds to the exigences of the moment". At the last conclave in 2005, after the death of John Paul II, it was widely thought that the cardinals would choose a Third World pontiff, perhaps from Africa or Latin America. The choice of Cardinal Ratzinger, who had been at John Paul II's side for over twenty years as head of the Congregation for the Doctrine of the Faith, was seen by many as a vote for a man who embodied continuity and had stressed the need to shore up the faith in the West itself in an age of secularism and materialism. This week Pope Benedict XVI congratulated Mr Obama on his "historic" victory, offering his prayers for the President-elect "and for all the people of the United States". Father Federico Lombardi, the Vatican spokesman, said that the Pope's message was "personal" and would therefore not be published. However he said that the papal message referred to the "historic occasion" of the election and congratulated Mr Obama, his wife and family. "He assured him of his prayers that God would help him with his high responsibilities for his country and for the international community," Father Lombardi said. The Pope had also prayed that "the blessing of God would sustain him and the American people so that with all people of good will they could build a world of peace, solidarity and justice." The message was sent via Mary Ann Glendon, the US ambassador to the Holy See. The Myth of Hitler's Pope is just one of many ways in which the KGB sought to discredit the Holy See, according to a new and excellent article from the National Review Online. The article has far-reaching implications, and actually connects a lot of dots. The Soviet Union was never comfortable living in the same world with the Vatican. The most recent disclosures document that the Kremlin was prepared to go to any lengths to counter the Catholic Church’s strong anti-Communism. In March 2006 an Italian parliamentary commission concluded “beyond any reasonable doubt that the leaders of the Soviet Union took the initiative to eliminate the pope Karol Wojtyla,” in retaliation for his support to the dissident Solidarity movement in Poland. In January 2007, when documents disclosed that the newly appointed archbishop of Warsaw, Stanislaw Wielgus, had collaborated with Poland’s Communist-era political police, he admitted the accusation and resigned. The following day the rector of Krakow’s Wawel Cathedral, the burial site of Polish kings and queens, resigned for the same reason. Then it was learned that Michal Jagosz, a member of the Vatican’s tribunal considering sainthood for the late Pope John Paul II, has been accused of being a former Communist secret police agent; according to the Polish media, he had been recruited in 1984 before leaving Poland for an assignment to the Vatican. Currently, a book is about to be published that will identify 39 other priests whose names have been found in Krakow secret police files, some of whom are now bishops. Moreover, this seems to be just scratching the surface. A special commission will soon start investigating the past of all religious servants during the Communist era, as thousands more Catholic priests throughout that country are believed to have collaborated with the secret police. And this is just Poland — the archives of the KGB and those of the political police in the rest of the former Soviet bloc have yet to be opened on the subject of operations against the Vatican. Please take the time to read this article and share your thoughts and insights. Beliefnet's Paul Wilkes, blogging the conclave from Rome, and NC Reporter's Stacy Meichtry report on German Cardinal Walter Kaspar's sermon today basically firing a shot at those supporting the election of Cardinal Joseph Ratzinger as the 265th Pope. Kasper told an Austrian Catholic paper that Dominus Iesus--the pope’s statement, but which bore Ratzinger’s mark, affirming Catholicism’s supremacy--“offended people. And if my friends are offended (referring to his years of Catholic-Lutheran dialogue) then so am I. It’s an unfortunate affirmation--clumsy and ambiguous.” Clumsy and ambiguous are certainly not casual terms between a cardinal and the Vatican. In various magazines, such as America in the United States and The Tablet in London, Kasper has repeatedly called for a scaled-down and more temperate church bureaucracy. He has openly supported divorced and civilly remarried Catholics in receiving the Eucharist, something they are currently forbidden under Church law. When Kasper registered his view, Ratzinger rejected this approach and maintained that only those who have received a marriage annulment and therefore are fully in communion with the Church could approach the altar to receive. Wouldn't want to hurt anyone's feelings, Cardinal. Kaspar is mentioned as a dark horse candidate -- a fact we can gratefully attribute to Pope John Paul's 26-year reign that enabled him to put his stamp on the College of Cardinals. NC Reporter's John Allen provides a Papabili run-down today. While you'll need (if you're of orthodox bent) to filter out the National Catholic Reporter's heterodox bias, it's still a very useful guide to the top papabile and a handy reference during the upcoming conclave. For those who'd just as soon avoid the Reporter, check out the Catholic World News' Toward the Conclave #10 from yesterday (HT: The Anchoress). It also offers links to the other nine parts of the Toward The Conclave series, which we give any conclave wathcer a solid grounding in the papal succession. Laurie Goodstein and Ian Fisher report in today's New York Times that Joseph Cardinal Ratzinger -- Prefect of the Congregation of the Doctrine of the Faith -- is the front-runner to be the 265th Pope, reflecting the conventional wisdom in the Italian press that Ratzinger is supported by as many as 50 of the 115 elector cardinals. Fr. Richard John Neuhaus reports hearing the same thing in the Rome rumor mills -- see his Rome Diary blog (HT to Hugh Hewitt). Based on Cardinal Ratzinger's record and pronouncements, his agenda seems clear. 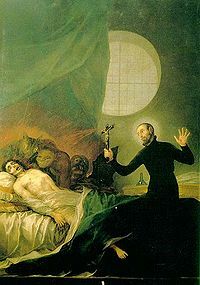 Inside the church, he would like to impose more doctrinal discipline, reining in priests who experiment with liturgy or seminaries that permit a broad interpretation of doctrine. But Cardinal Martini appears to control far fewer votes. He has said he has not ruled out changes to priestly celibacy or the bans on contraception and on women serving as deacons. He has a form of Parkinson's disease and, unlike Cardinal Ratzinger, is not considered an active candidate. Experts say that while he respects Cardinal Ratzinger, Cardinal Martini does not support his vision of the church. "Martini," said Alberto Melloni, a papal historian, "thinks that if the church does not move on in terms of doctrine, it is condemned to lose the content of Christian truth." While it's basically a good, informative article, it suffers from the same defect as other secular MSM stories -- namely, the reporting spirit is so secular. I genuinely believe this handicaps the coverage provided by MSM monoliths like the NYT. MSM reporters, being overwhelmingly secular or non-religious in their world view, tend to view the conclave as a fancy smoke-filled room where party bosses pick the next Pontiff. Roman Catholics believe the Holy Spirit is at work in the conclave, but MSM reporters (my gut suspects) view that belief as a lot of superstitious hocus-pocus. Which is why you'll see little mention of it during conclave coverage, except in a detached, patronizing tone more suited to an anthropologist discussing the superstitions of primitive tribes.